(PHILADELPHIA) November 30, 2017 – The Animal Care and Control Team of Philadelphia (ACCT Philly) announced today that adult dog adoption fees will be waived for the entire month of December thanks to the generosity of local veterinarian, Joan Capuzzi, V.M.D. 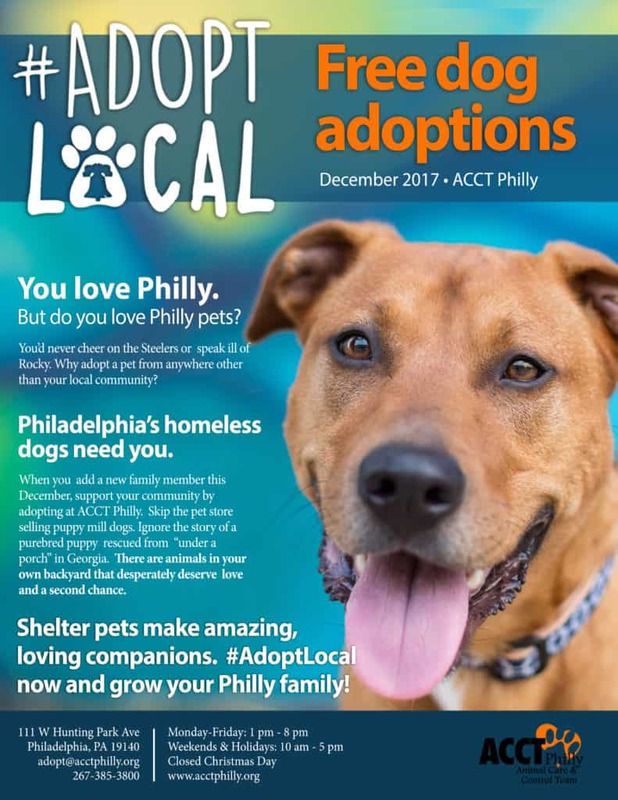 The adoption promotion marks the start of the ACCT Philly #AdoptLocal awareness campaign to highlight the importance and lifesaving impact of supporting local shelters. “I’ve been a veterinarian in this area for 20 years, and every day I see people bringing in puppy mill dogs, often inbred from Lancaster County, as well as young dogs from southern states that have been passed off as ‘rescues,’” Capuzzi said. As an open admission animal shelter contracted by the City of Philadelphia to perform animal control, ACCT Philly is required to accept and provide services to the more than 23,000 animals that come through its doors every year. Despite the large number of animals ACCT Philly services every year, the organization has managed to reduce its annual euthanasia rate since 2012. However, that successful track record remains in jeopardy as long as the public continues to patronize puppy mills and irresponsible breeders. ACCT Philly hopes to win over would-be pet buyers and further reduce the euthanasia of loving pets who simply need a second chance. As an additional incentive for more dog-experienced potential adopters, adoptable “urgent” dogs (dogs that must find immediate exit or face euthanasia due to medical or behavioral challenges) will be sent home with a free, 40-pound bag of dog food! ACCT Philly adoption counselors will help potential adopters select a dog that best fits their lifestyle and family. Even if you’re not ready to adopt, there’s still a way you can help local pets. Dr. Capuzzi will match all donations made in December up to a total of $3,000. To #adoptlocal at ACCT Philly this December, please visit the main shelter location at 111 W Hunting Park Avenue. All regular adoption screenings and procedures still apply. Cat lovers will also be able to get in on the action with plenty of discounted cat adoption specials planned for the holiday season too! Donate towards the cause here. To view adoptable pets and learn more about ACCT Philly, check out their Adopt webpage and follow them on Facebook, Twitter, and Instagram.